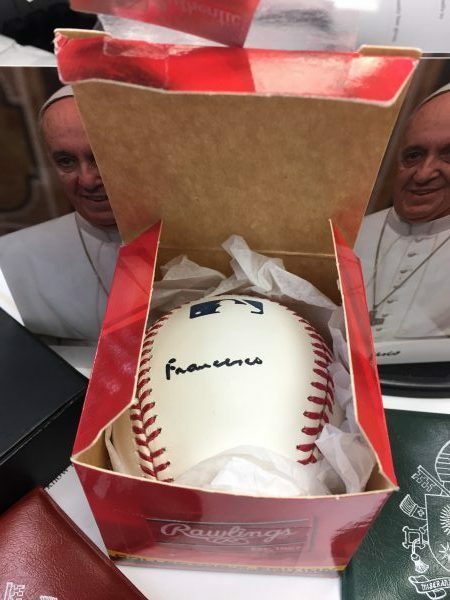 Pope Francis has signed a baseball that has become one of the centerpieces of a collection of baseballs with the autographs of world leaders ranging from Nelson Mandela to Mikhail Gorbachev. Randy Kaplan, a Long Islander whose collection of baseballs signed by some of the world’s best known leaders, set out to get the Pope to sign. Kaplan said he pitched the idea to a cardinal who agreed to help – with team work winning out. “I wrote to him and said, ‘Your eminence, would you be kind enough to help me try and procure the Pope’s signature?’” Kaplan said. The collection already obtained some news coverage beyond U.S. borders. “The Associated Press did a story on it and it went all over the world,” Kaplan said. The cardinal agreed to present the proposal to the Pope’s personal secretary. Then Kaplan waited to see whether he’d strike out or succeed. The Pope signed the baseball, which Kaplan received along with printed cards with the Pope’s photo and signature and rosary beads. This isn’t the first baseball Pope Francis has signed, bridging the gap between the sport and the more spiritual side of leadership. Father Richard Kunst met with the Bishop of Rome who got the Pope to sign a baseball that he brought back to his church in Duluth, Minn.
And the Koeppel family of Palm Beach got the Pope to sign on a visit to the Vatican after William Koeppel tossed a ball to the pontiff from the crowd. The collection includes 350 baseballs signed by leaders including numerous American presidents, prime ministers, and other chiefs from nations all around the globe. Next up at bat? 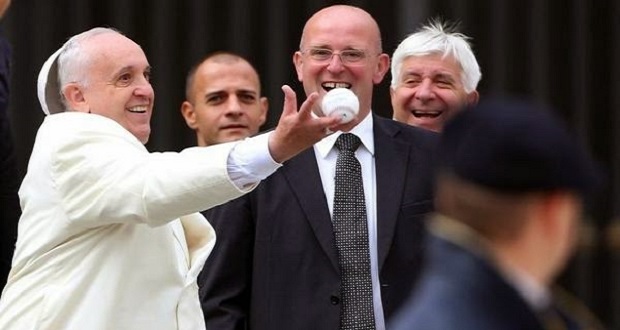 He hopes to get pope emeritus Benedict XVI to sign a baseball, proving that something as simple as a sport, and one person’s passion, can bring people together. Even more to the point, Kaplan’s commitment to growing his collection seems to be getting something done that, until now, probably would have seemed impossible.